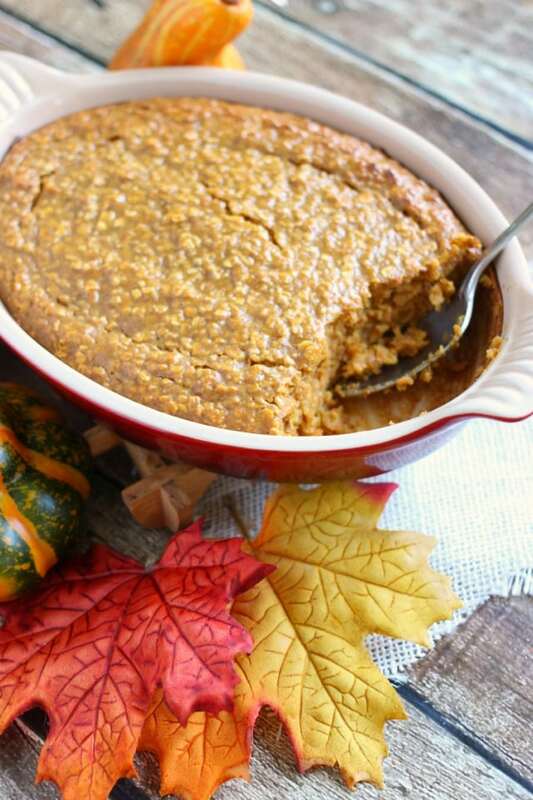 You are here: Home / breakfast / Pumpkin Oatmeal – The Best Baked Pumpkin Oatmeal! 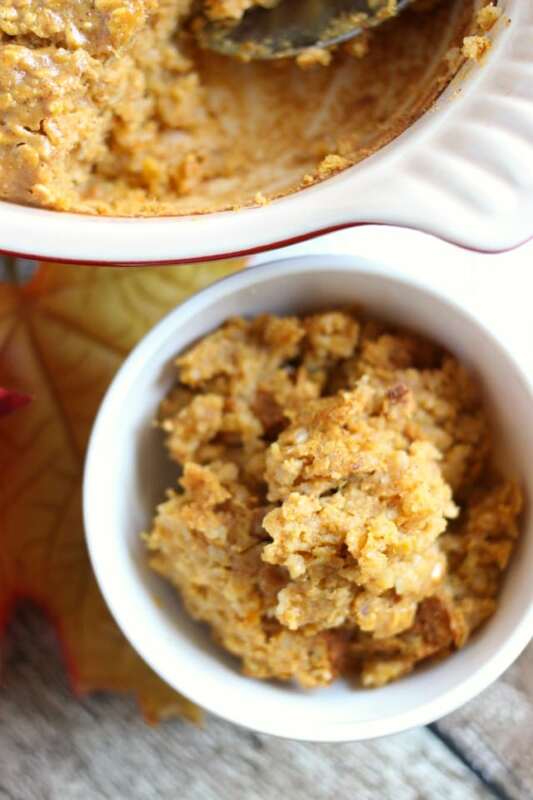 Pumpkin Oatmeal – The Best Baked Pumpkin Oatmeal! 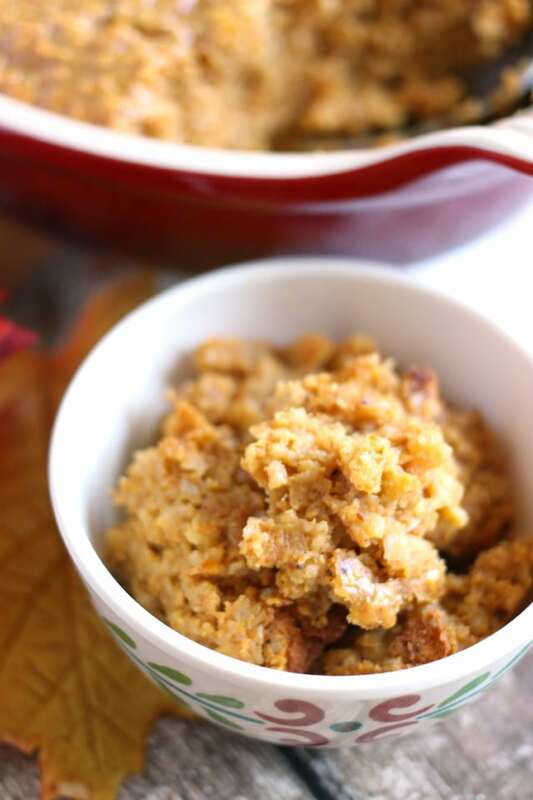 This Pumpkin Oatmeal is the perfect simple and delicious Fall make ahead breakfast recipe! Yay for Pumpkin Oatmeal! I know, I switched gears on you recently with the whole peppermint and chocolate thing (mmmmm), but I feel like pumpkin still has a place after Thanksgiving, right? I mean, it shows up at Christmas dinner, so it’s not exactly like white after Labor Day. (Which I still call shenanigans on, anyway). If we’re being totally honest, I’m a year round pumpkin indulger, I just try not to be too ‘in your face’ with it all the time. But if you could see my pantry you’d know that pumpkin soup is just as likely to show up on our menu in July as it is in October. Because, PUMPKINNNNNN. For Christmas, we visit my parents every year and there are at least 20 folks and often more for breakfast. I usually put out a giant dish of scrambled eggs, bacon, and bagels. But this year we’re numbering more like 30 so I was trying to think of something easy we could shove in the oven and ignore for a while. The savory stuff is covered, and I was thinking about maybe a baked oatmeal. And then I realized we’re coming to the end of the season where it’s acceptable to serve pumpkin at all meals, so duh. 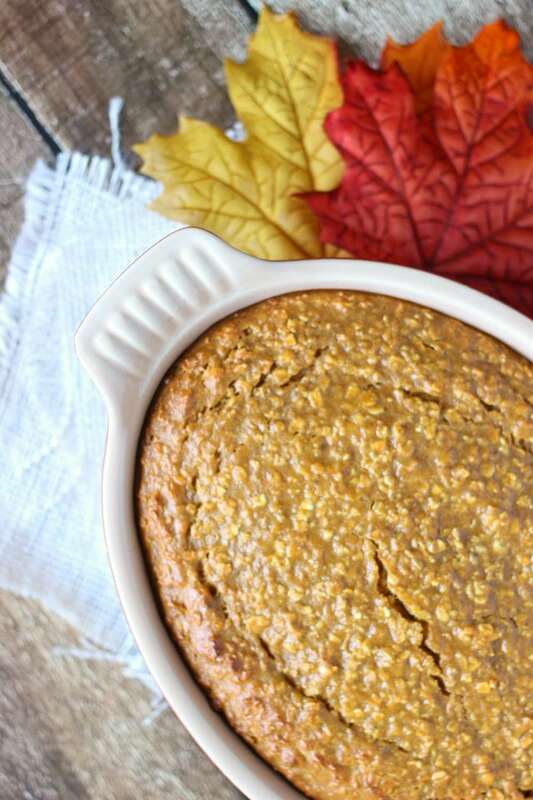 Baked Pumpkin Oatmeal! 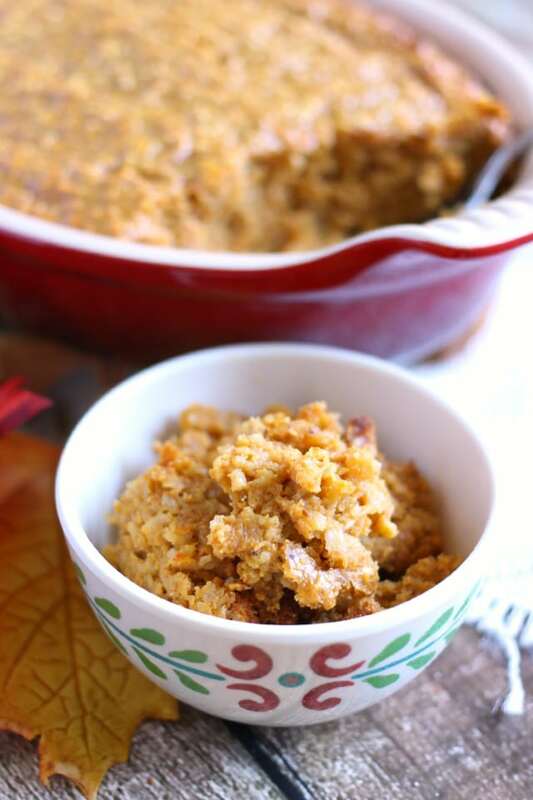 If you like Baked Pumpkin Oatmeal, you might also enjoy these other pumpkin inspired recipes! Pumpkin Curry Soup – rich and filling, this pumpkin curry soup only takes about ten minutes to make from start to finish, but is delicious enough to serve to the queen! If you know a queen, that is. 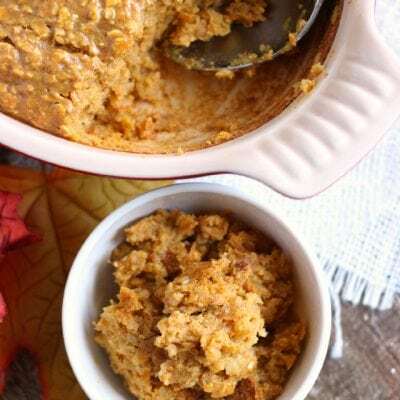 Two Minute Pumpkin Pudding – it might actually take less than two minutes to make this delicious pumpkin pudding treat. Pumpkin Chili – add some fiber and fall flavor to your chili with this yummy pumpkin chili recipe! 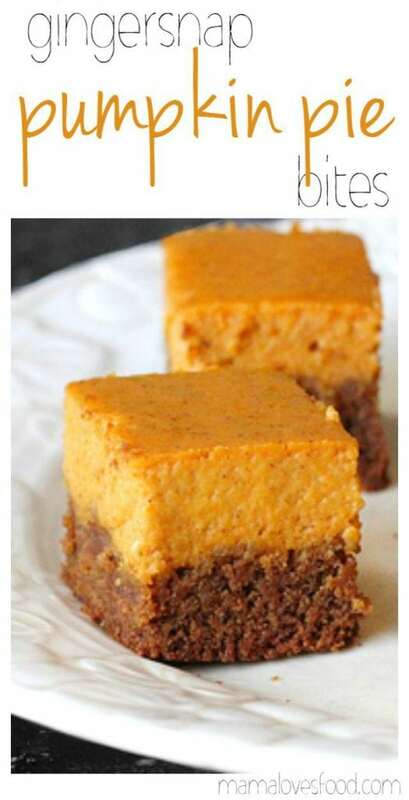 Gingersnap Pumpkin Pie Bites – gingersnap pumpkin pie bites are one of the most popular recipes on this site – you’ll definitely want to make a double batch! 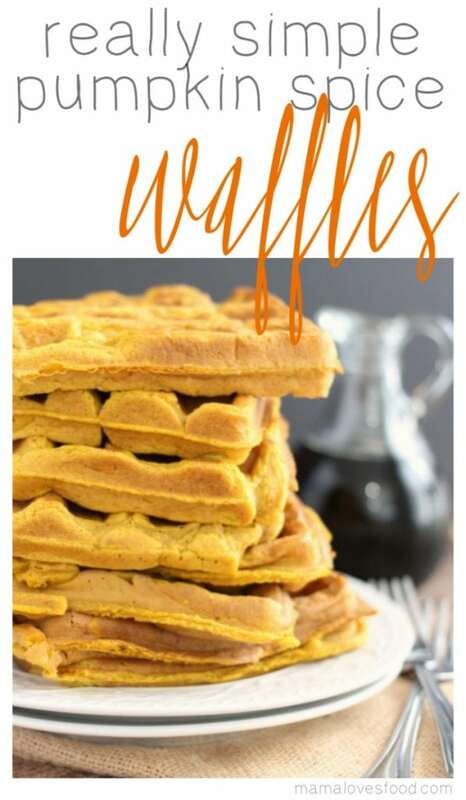 Pumpkin Spice Simple Syrup – add this pumpkin spice simple syrup to your coffee or ice cream. And thank me later! Pumpkin Spice Cream Cheese Frosting – only a handful of ingredients that you probably have in your pantry right now! 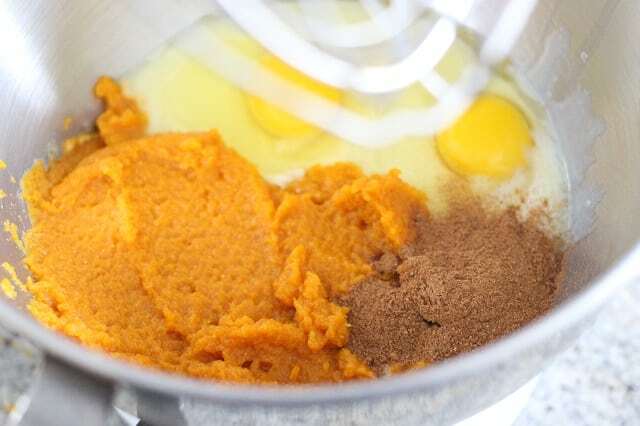 And it goes so well on our super simple Pumpkin Spice Mug Cake! Simple Savory Pumpkin Soup this pumpkin curry soup is one of the first pumpkin recipes I developed and it’s still one of my absolute favorites. Pumpkin Spice Frozen Coffee Drink – remember how we talked about that simple syrup? Well, this is next level stuff! Pumpkin Pie Spiced Meringues – light, airy, and perfectly pumpkin spiced. These bite sized meringues are delicious! Pumpkin Spiced Butterscotch Pudding Cups – level up your pudding game with a few choice spices! Easy Pumpkin Drop Biscuits – make these for your next holiday meal and you won’t be disappointed. They’re a family favorite in our house! Flourless Pumpkin Spice Mug Cake – cake in a mug. Almost better than cake by the ocean. But then, you could totally eat this pumpkin spice cake in a mug by the ocean. No Churn Pumpkin Pie Ice Cream – those of us who live in Florida (or Texas, or Arizona) love pumpkin spice, but are also not quite ready for warm treats. This pumpkin spice ice cream is the perfect solution. 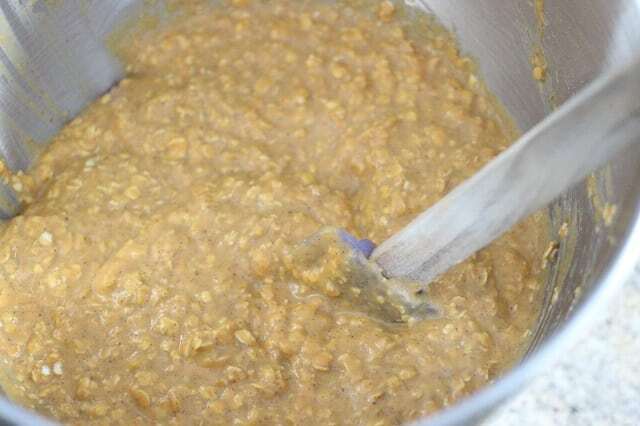 Pumpkin Apple Paleo (Un)Oatmeal – if you’re grain free and looking for an oatmeal-like treat, this is exactly what you need! 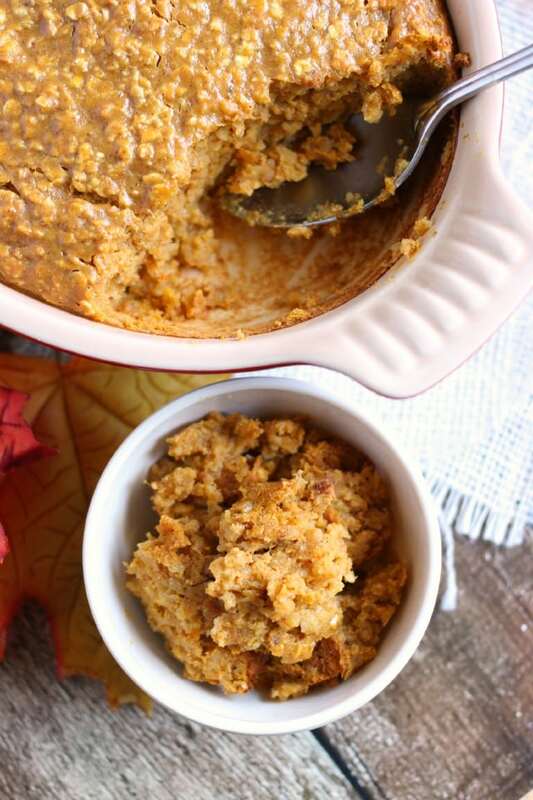 No-cook Pumpkin Butter – you won’t believe what we used to sweeten this pumpkin butter! Gingersnap & Pumpkin Cinnamon Roll Cookies – cinnamon roll sugar cookies just got even better! 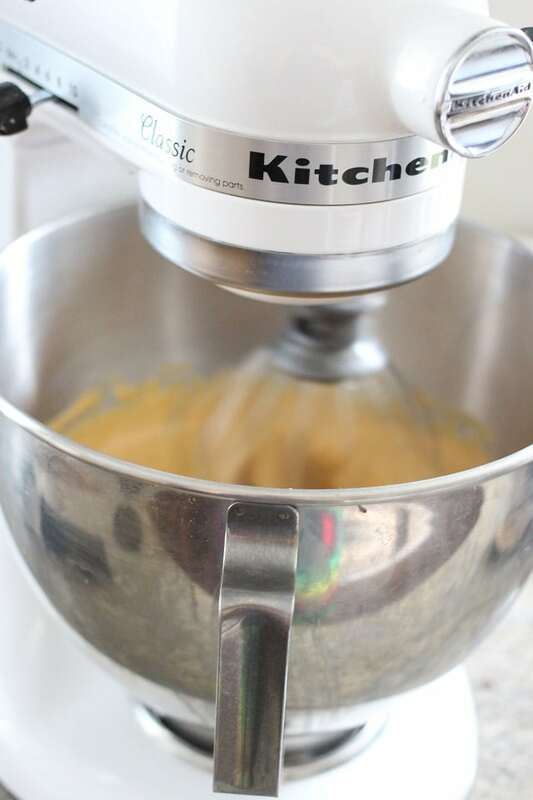 Simple Pumpkin Spice Cake – literally my favorite cake. Favvvvvvorite. This Pumpkin Oatmeal recipe is the perfect simple and delicious Fall make ahead breakfast recipe! 1 tablespoon pumpkin pie spice here's how to make mine! Beat pumpkin, milk, spice, and eggs with an electric mixer for about 2 minutes until everything is thoroughly incorporated. 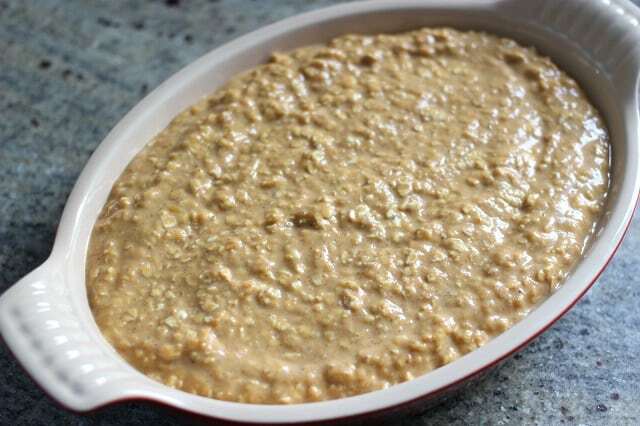 Stir in oatmeal, then pour into a small greased casserole dish and bake at 350 degrees for 60 minutes. Soooo when do you add the oatmeal? 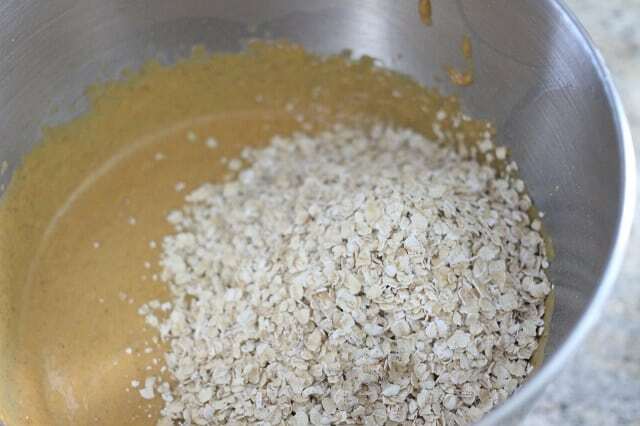 Or do you pour the mixture over the oatmeal? sorry! can't believe i left that out — it's in the pictures though. LOL, you just stir it in after you beat the other ingredients. i fixed the directions. thanks for letting me know! Is it good to keep in the fridge and reheat it?